ZedBoard is a low cost development board based on Xilinx Zynq-7020 SoC featuring two Cortex A9 cores and FPGA fabric, together with lots of ports and expansion I/Os, and running Linux. The problem is that “low cost” for this type of board still means $395 (or around $300 for academia), and you only get to this price because it’s been subsidized, and the normal price is actually $495… That’s why Avnet has just come with a new version of the evaluation kit called microZed that sells for $199 and targets applications such as general Zynq-7000 AP SoC evaluation and prototyping, embedded system-on-module (SOM) applications, embedded vision, test & measurement, motor control and software-defined radio. The evaluation kit comes with the MicroZed board, a micro USB cable, a 4GB μSD card, Xilinx Vivado WebPACK license with Logic Analyzer (device locked), and a Getting Started card. The community provides full documentation including a getting started guide, hardware guides, schematics, bill of materials, PCB layout, and mechanical files. There are also a few training videos for both microZed in particular, and Xilinx Zynq in general. Strangely, I’m struggling to find details about Linux on the platform. Let’s have a quick look at the difference with the Zedboard, and how they managed to cut costs. The main difference is whereas Zedboard is based on Zynq-7020, MicroZed is powered by Zynq-7010. The latter offers 28K logic cells, against the former 85K logic cells. 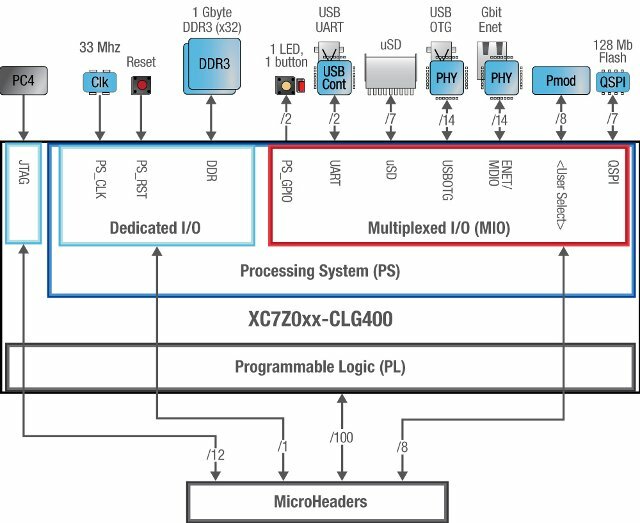 Zynq-7010 has also about a third of Zynq-7020′s look-up tables (17,600 LUTs), extensible block RAM (240KB), programmable DSP slices (80), peak DSP performance (100 GMACs), and flip-flops (35,200). MicroZed has 1GB RAM instead of 512MB on Zedboard, so no cost cutting here, I presume. QSPI flash is smaller (128MB vs 256 MB), and MicroZed goes without many of the video and audio interfaces found in Zedboard. 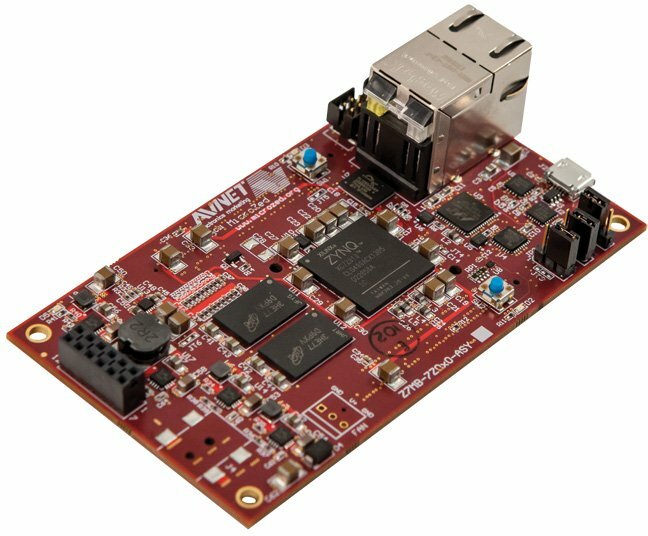 As I mentioned previously, MicroZed evaluation kit costs $199 on Avnet, but the board can also be used like a system-on-modules on be bought for $192 (Zynq-7010 version) or $289 (Zynq-7020 version). Where are the 100-Pin I/O connectors? Are the on the bottom of the board? Yes, they indicate the header are at the back in the picture at http://www.zedboard.org/sites/default/files/documentations/QSC-Z7MB-7Z010-G-v1d_0.pdf, but I can’t find a picture of the back of the board. With the 7020 eventually available at $199. (Unless you kickstarted Parallella). hello , is it possoble to build a CAN communication for this board ? I’m not 100% sure, but they mention a CAN interface in the hardware user guide linked above. it may also be possible to use the FPGA fabric to design a CAN bus. If that’s the case the parallella does indeed look like a better deal. If you want to use GPIOs, it apparently costs $119. I’m not sure the model in MicroZed or Parallella is powerful enough, but still interesting to know practical applications. I’ve got one of these – one thing to note is that all external connections to the FPGA fabric is through the headers on the bottom of the board. The PMOD is connected only to the ARM core’s perpherials.